As a lot of you probably know, on April 21, 2015, Google has launched the new Mobile Friendly Algorithm update the main idea of which is to reward mobile-friendly web pages by boosting their rank in mobile search results and, on the other hand, decrease search engine ranking of the web pages not optimized for mobile viewing. That’s right, Google ranks mobile-friendly websites higher! Google is certain that with today’s mobile usage on the rise, it’s critical that users are able to find the most relevant information they search for and enjoy their web surfing experience on any device. The main principle of the world’s most popular search engine resulted in this update of a great impact being seriously pushed into the world web leaving millions of web owners practically with no choice except to optimize their websites. A quick Q&A overview below will hopefully help our readers understand what this new policy means and what can be done to be among Google-favored. Did Google really launch their mobile-friendly updates already? It sure did, the change affected mobile searches in all languages all around the globe. You can actually see it yourself on the mobile search results page that mobile-friendly sites are tagged with “Mobile-friendly” (as captured on this blog post image). Pretty serious, as it’s now the main criteria influencing the search results on mobile devices. Even if your website is SEO optimized and used to be highly ranked in the search results, the chances of keeping your old positions are pretty slim, unless the web page has an absolutely great content for the search query. Although the desktop and tablet search is not affected, this should not mislead you to thinking that there’s nothing to worry about if most of your customers aren’t mobile users. With a rapid growth of technology and mobile users who browse information in the comfort of their mobile phones, this may change in a blink of an eye and it’s very important that your target audience ends up on your website rather than a website of your competitors. How do they check the website if it’s mobile optimized? It’s actually a web page that’s being analyzed individually rather than a website in general, therefore only pages that are not mobile-friendly will be impacted in case your website is at least partially optimized for mobile viewing. Google has the power, techniques and certain criteria for determining the mobile-friendliness of a website. You can analyze individual web pages if they meet the mobile-friendly criteria with Google’s free Mobile-Friendly Test. What should owners of “mobile-unfriendly” websites do? The news speak for themselves and conclusion is quite obvious as the bottom line is that Google wants your website to serve mobile users just like it does to desktop users. Although this is an important and sometimes difficult decision to make, especially for small businesses, no one is to blame Google for their new policy given the simple fact that mobile usage is growing so fast and becoming more common throughout the whole world. Good news are that it’s completely up to you if you want to set up a whole separate mobile website for mobile viewers or make a decision in favor of getting Responsive Web Design (RWD) as it doesn’t matter in terms of mobile-friendly consideration. 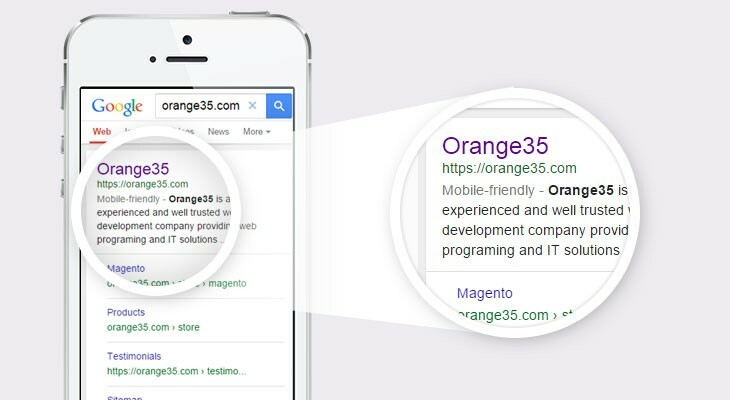 Orange35 has been including responsive web design technique into websites built for our customers since 2012. Responsive design is not that difficult if included from the very beginning, however it may be more problematic to add it later in, sometimes it’s even less time consuming to re-build a website with RWD built-in than making an existing site responsive, especially if it’s pretty old. If it is old, there are many reasons to get a new website: it’s a chance to freshen up your website, make it mobile-friendly + get all the most up-to-date features including management from the back end. Whether you’re looking for a ready website plan or a completely custom solution or even simply looking to make your existing site responsive – we’re always here to assist and discuss options you have. Then, Google determines if a page is mobile-friendly or not every time it’s regularly crawled and indexed by Google-bot, therefore once your web pages are optimized for mobile viewing, you can either wait for your site to be indexed on schedule or speed up the process by submitting a sitemap using Webmaster Tools. Do not postpone a question of improving your mobile viewers’ experience and don’t think of Google’s policy as a punishment, because in the end, it’s you who’ll be benefited for making right in time decisions and gaining more views and general trust! Events, IT articles, Tips internet, mobile devices, responsive design, technology. permalink.